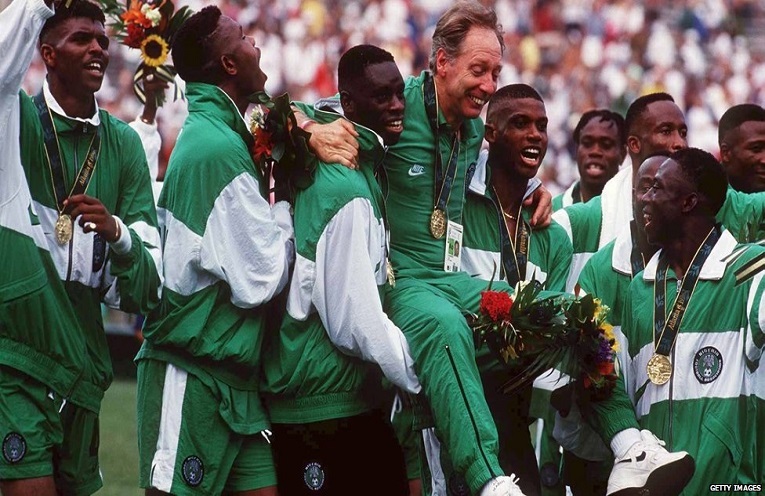 Atlanta 96: A case for a documentary on the glorious outing of Nigeria at the Olympics games. On the 14th of November, 2017, the Nigerian Super Eagles defeated Argentina 4 goals to 2 in an International friendly match in faraway Russia. For once we put aside our tribal and religious differences and united as one nation. The excitement and emotion displayed by Nigerians after defeating Argentina took me back to when we won the 1996 Olympics football tournament in Atlanta. It’s been 21 years since Nigeria made Olympic football history by becoming the first African and non-European and South American team to win the gold medal. The memories however still remain vivid as yesterday. The victory has come to be regarded as one of the feel-good stories in the history of Nigeria’s sport. The team overcame what are usually considered much stronger teams, such as Brazil and finally Argentina to earn the gold. I think it is safe to say it’s about time someone makes a documentary, recounting the nostalgic nail biting thrills of the Nigerian Dream Team at the Olympics games in 1996. Sports films is a genre that is yet to be explored by filmmakers in Nigeria. According to Wikipedia, sports films have been made since the era of silent films, such as the 1915 film The Champion starring Charlie Chaplin. A great place to start with this genre will be the Olympics victory by Nigeria in 1996. Which young or old filmmaker will be bold enough to explore this uncertain and untested ground? Filmmaking is definitely not a walk in the park, but whoever is going to pull of this proposed film on Atlanta 96 has a vast amount of materials needed to pull this off. I’m pretty sure all the footage from the group stage to the finals can be sourced for online, FIFA or from personal archives. The 18 players with an average age of 40yrs led by Coach Jo Bonfrère (71) are all still alive as of this time, to grant interviews and offer insight on how they achieved victory. These players will definitely be excited at the prospect of having one of their most memorable times of their lives re-enacted. Getting their cooperation and support shouldn’t be much of a hassle. The Federal Government and the Nigerian Football Association (NFA) can also play a huge role by supporting whosoever wishes to take this project up. The United Nations Report on the International Year of Sport and Physical Education 2005 highlights the benefits that sport can bring in building national identity, especially at the level of elite sport. Sport can provide a positive image of the nation to the international community. Studies on specific cases have shown that sport, especially football, can positively contribute to strengthening national pride and forming a cohesive national identity. The time has come for a brave and forward thinking filmmaker to explore this ground. The question now is who will it be?